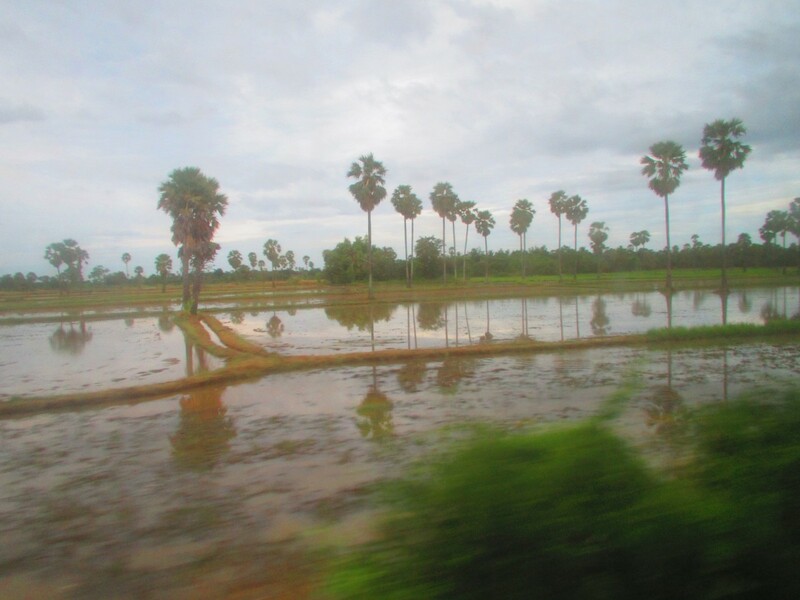 I wrote a blog a while ago about planning the trip from Bangkok to Penang by train. For more information, as mentioned in the blog, see The man in Seat 61. Now it was time to do it. But with no planning. 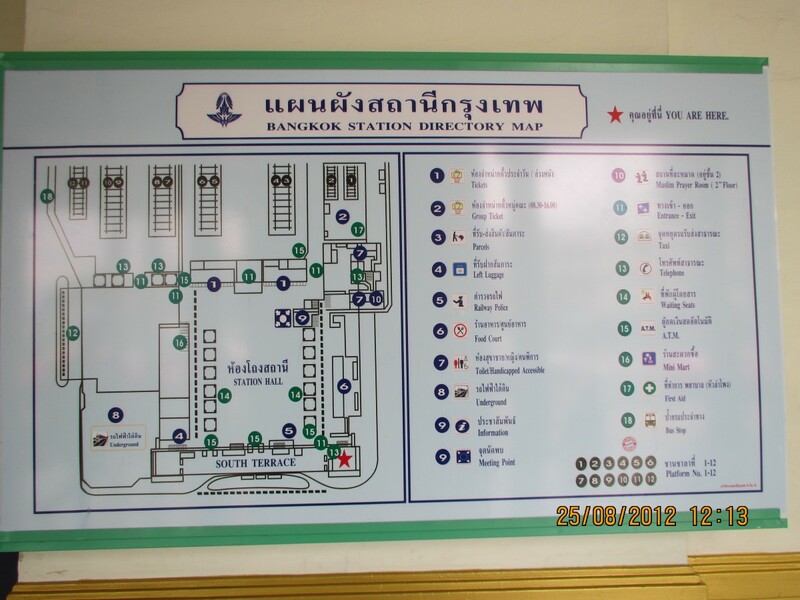 I flew in to Bangkok with no advanced planning and no bookings, and caught local public transport from the airport to the railway station. See a recent blog about this. There were quite a few English-speaking staff around to help you – at first I imagined when I was accosted they’d try to sell me something, but they were just helping you with any information you might need. 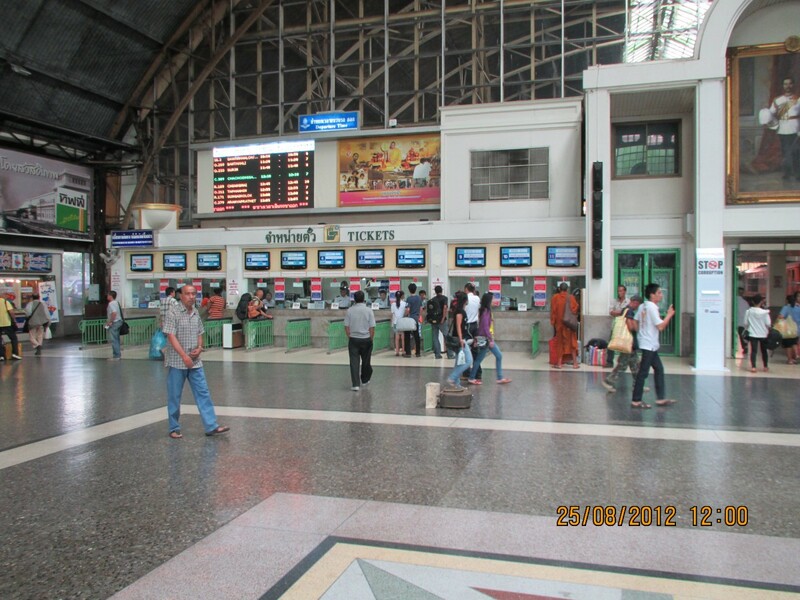 I have been told you have to book a few days in advance for the train to Butterworth (the train terminus for Penang). 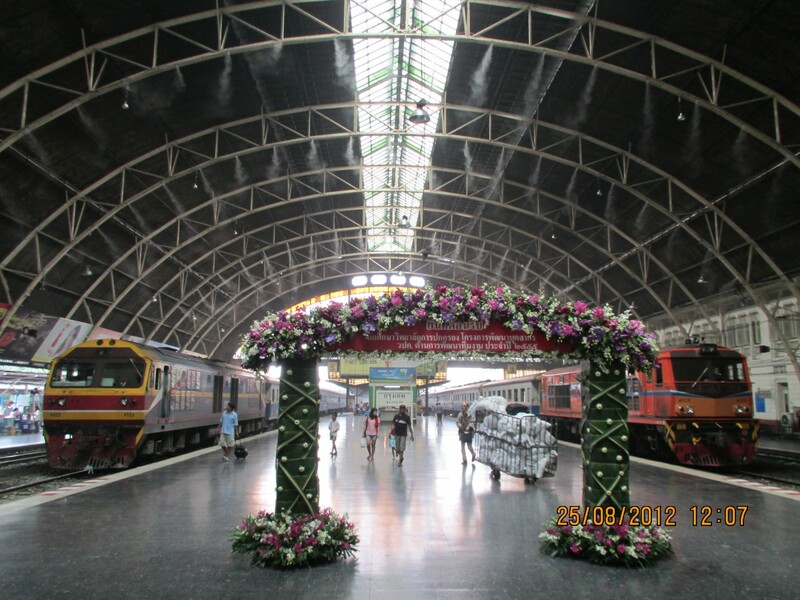 Indeed, when I arrived at the train station they told me the train was fully booked. 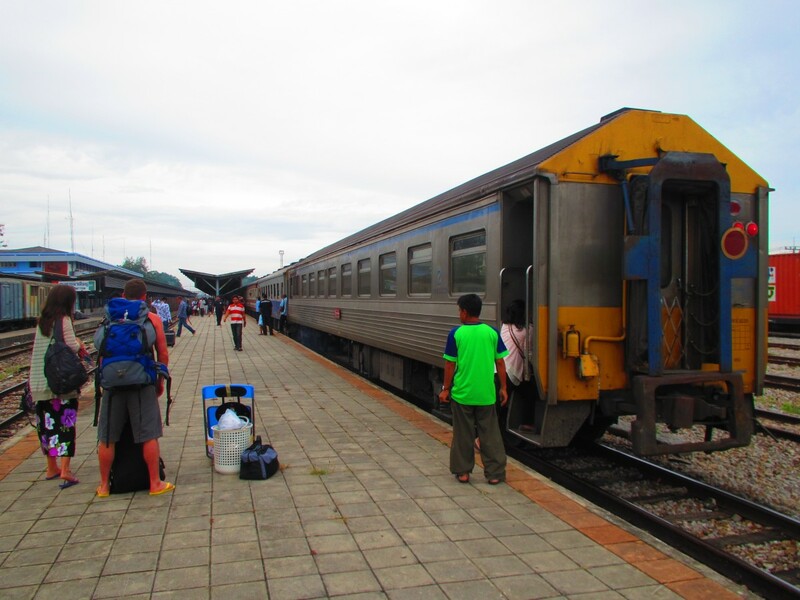 It was 12:00, the train to Butterworth departs at 14:45. 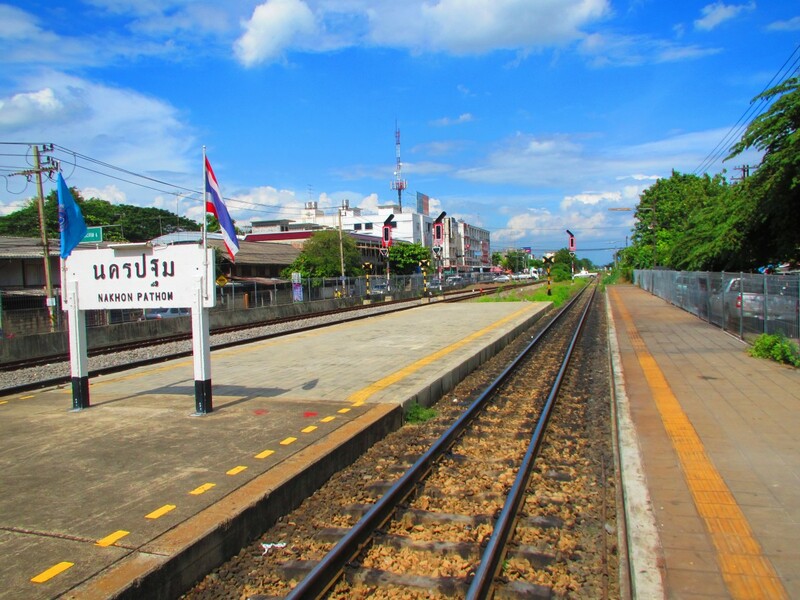 I then asked for a ticket for the next train to Hat Yai, from where I thought I might be able to board the aforementioned train if it was running late, or otherwise get a minibus to Penang. 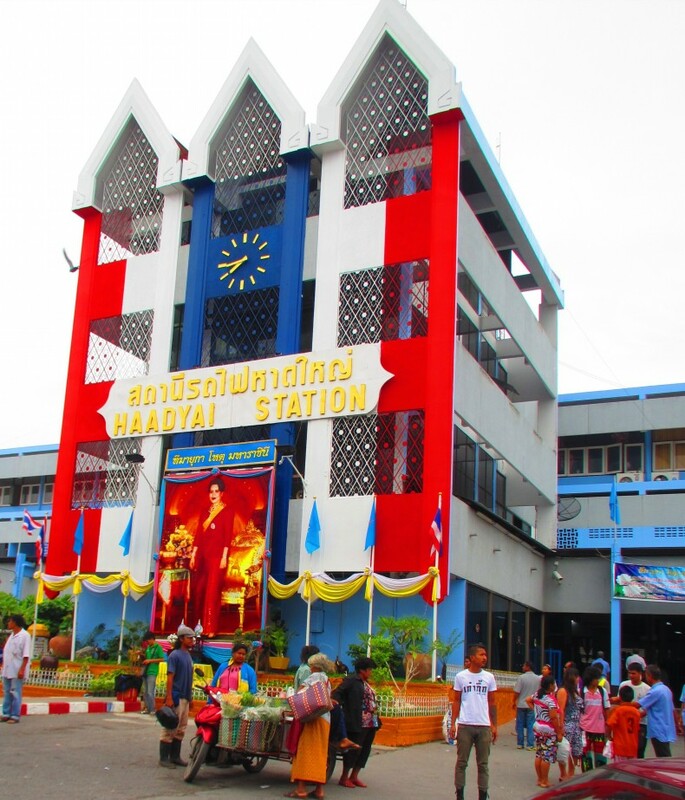 Train 35 to Butterworth is scheduled to leave at 14:45 and arrive in Hat Yai at 06:35, on the way to Butterworth; and Train 171 leaves at 13:00 and arrives in Hat Yai at 06:45, but then goes on to the south-east of Thailand. 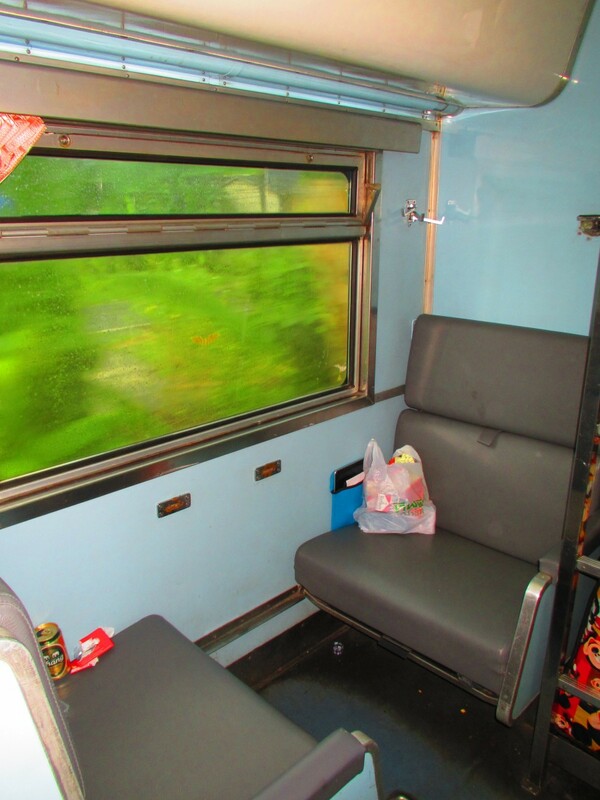 I got a lower bunk in the air conditioned sleeper for about 845 baht. They didn’t accept cards so I had to pay cash. 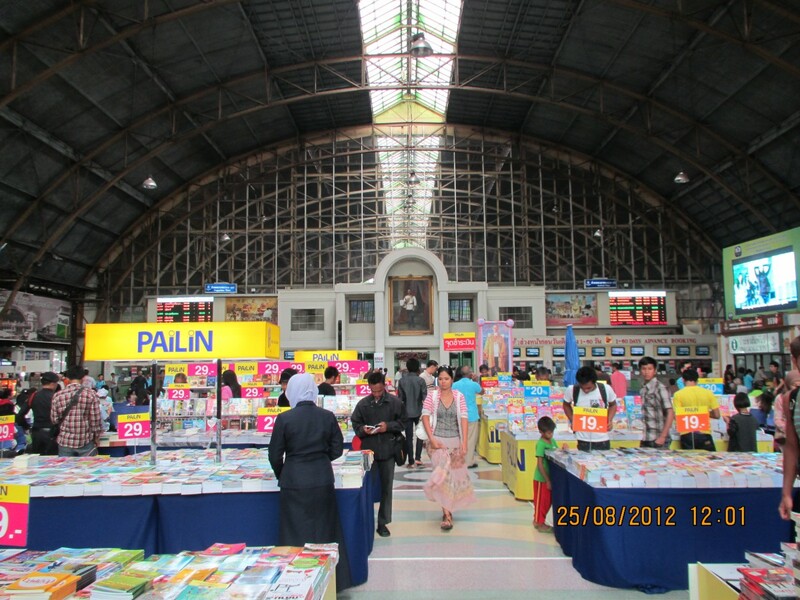 Bangkok Station is old and run down. I looked around a little and then decided I may as well just get on the train as it was sitting in the station. 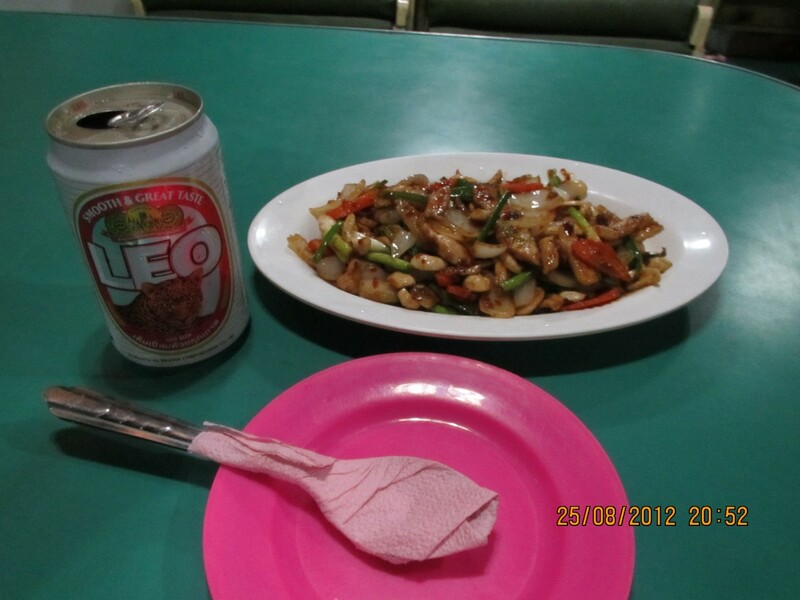 I didn’t bother to buy any food or drink in advance, although it was available at the station. 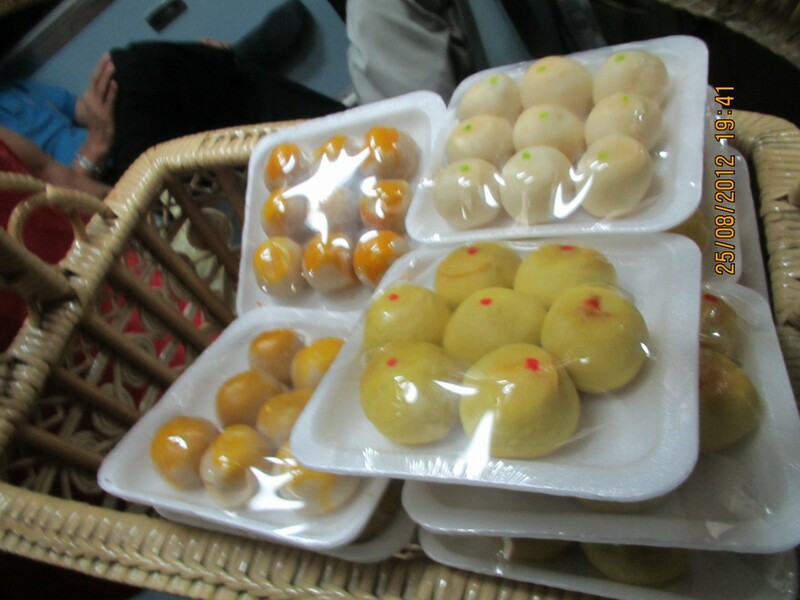 I just wanted to take things as they came, and probably pay a bit more buying on the train, instead. 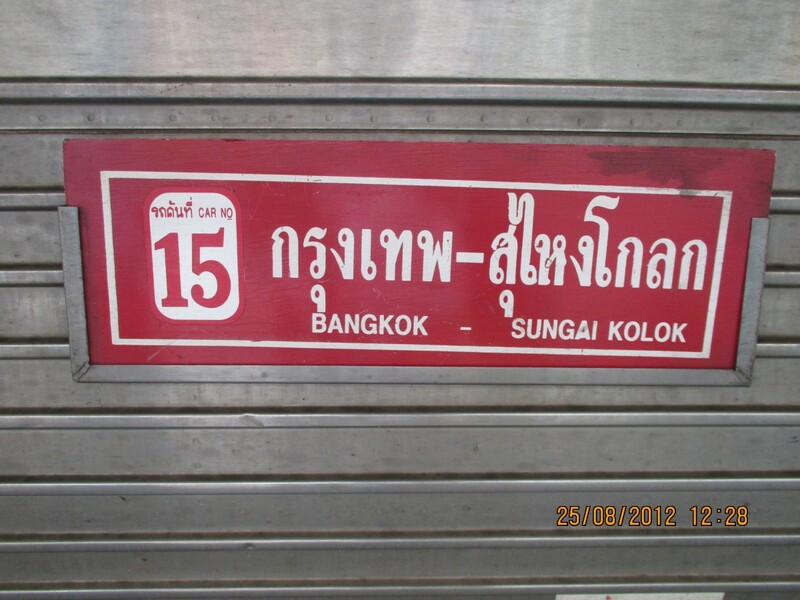 Finding the train, carriage and then the seat number was easy as everything was labelled. 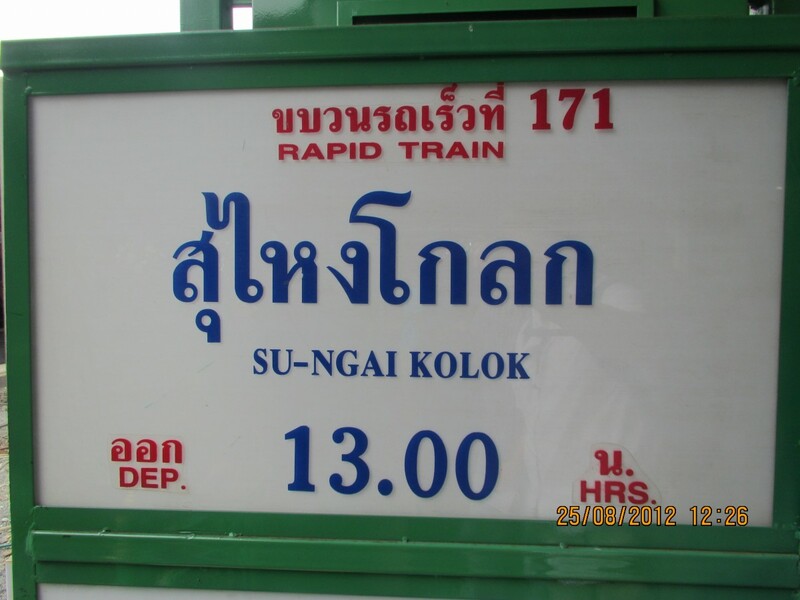 At 13:00, with no whistles or fanfare the train pulled out of the station. Amazed it was punctual, I sat and watched the view – for 100m until it stopped and sat for a while. Then moved another 500m and stopped for a while. you got a nice view of urban blight alongside the line. The train continued along with occasional stops for an hour and a half, and one notices some modern new stations being built along the route. And then finally we seem to be getting out of the city. 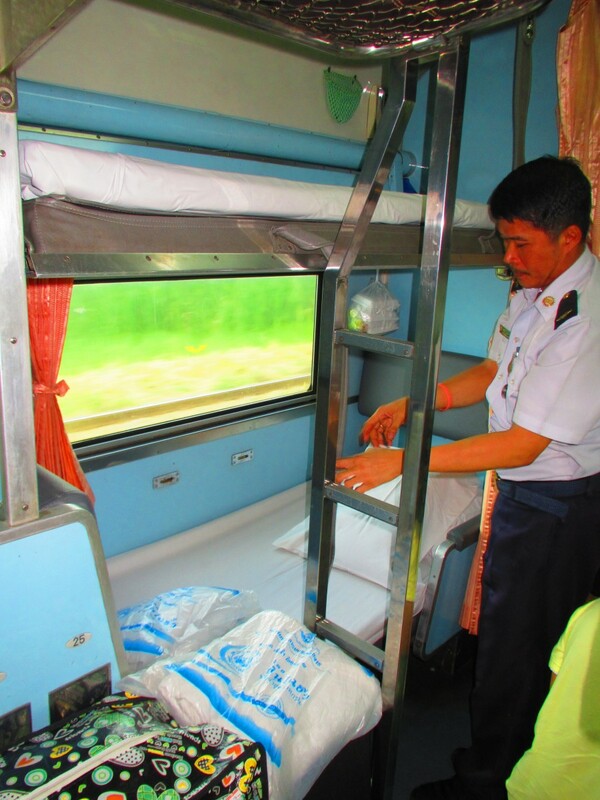 Sitting in the train seats is reasonably comfortable, but many people had their beds made up by the attendant quite early, and then either relaxed on the bed, or slept. 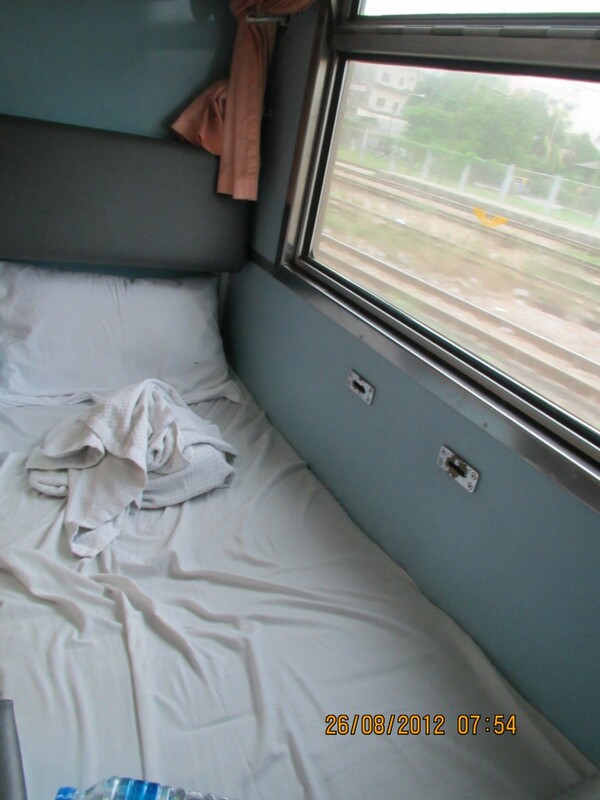 The lower bunk was then much better as you had a view. 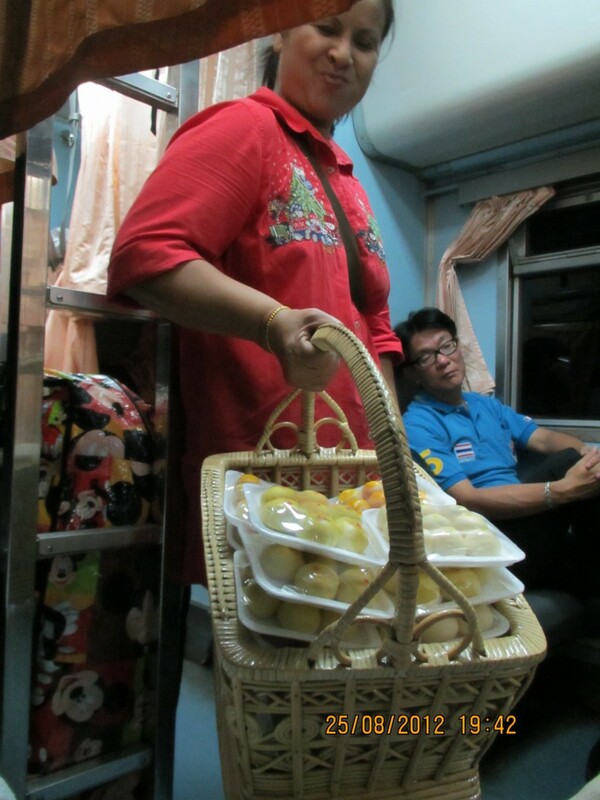 People walk through the train selling snacks, drinks – water (15 baht), beer (50 baht), or meals – egg, and beef (?) on rice. 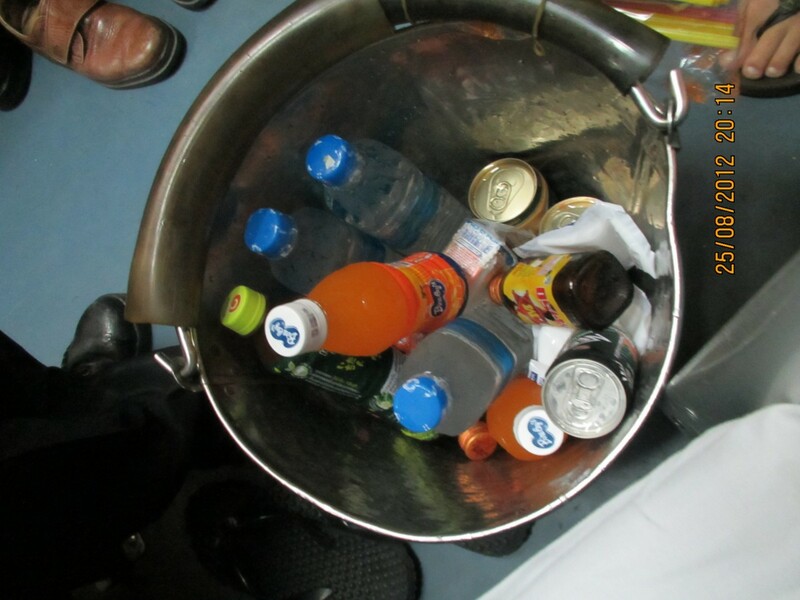 At some stations people also are selling things. The first time I bought beer I was charged 75, and then the guy assumed he could keep the change and just walked away. It also turned out he overcharged me, as I now know. As is predictable, the toilet is pretty disgusting. 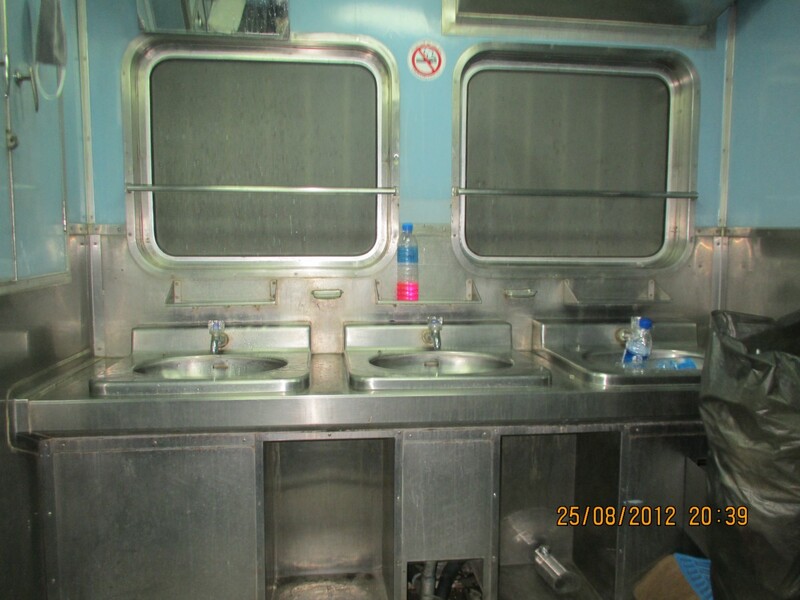 There are wash basins at the end of the carriage, which are OK. The train stops at some stations, and you never know for how long, or when the train is about to leave, so it is unwise to get off at all. I didn’t see any mosquitoes, but I did get one bite. 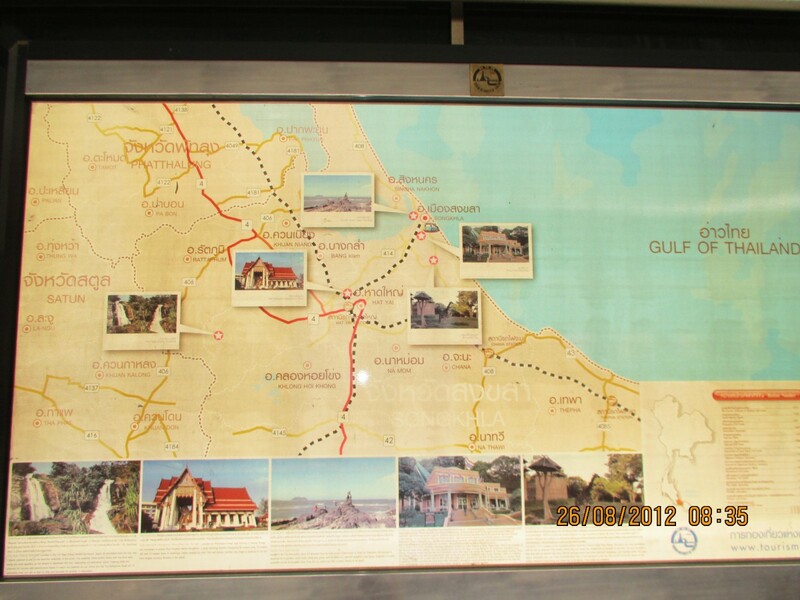 We reached Hua Hin at 6:15. The attendant comes around and tells you just before you reach your stop. Otherwise, you have no idea where you are, or if the train is on time or running late. There are no announcements. When it gets dark you cannot read the signs at all at most stations. 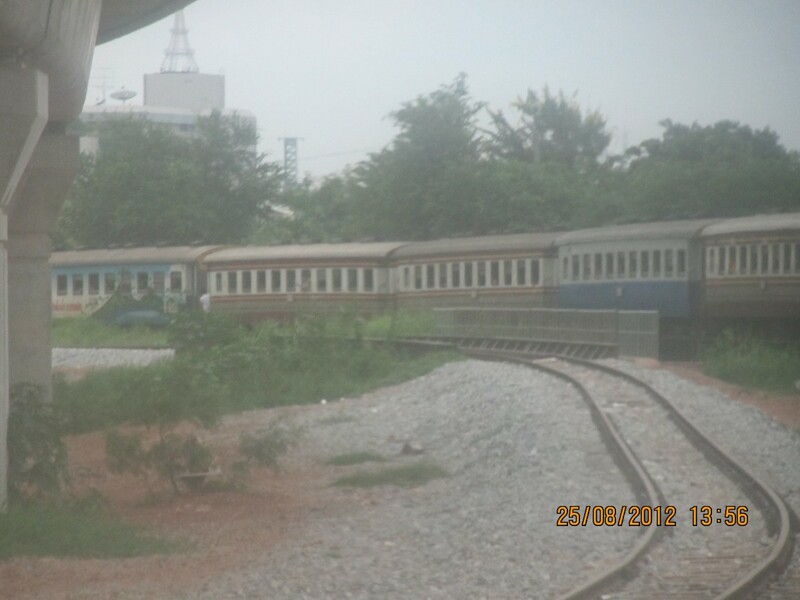 At some stage I walked through the train. It is kind of dangerous walking between the carriages, and sometimes the doors are open, so you want to keep a firm hold. 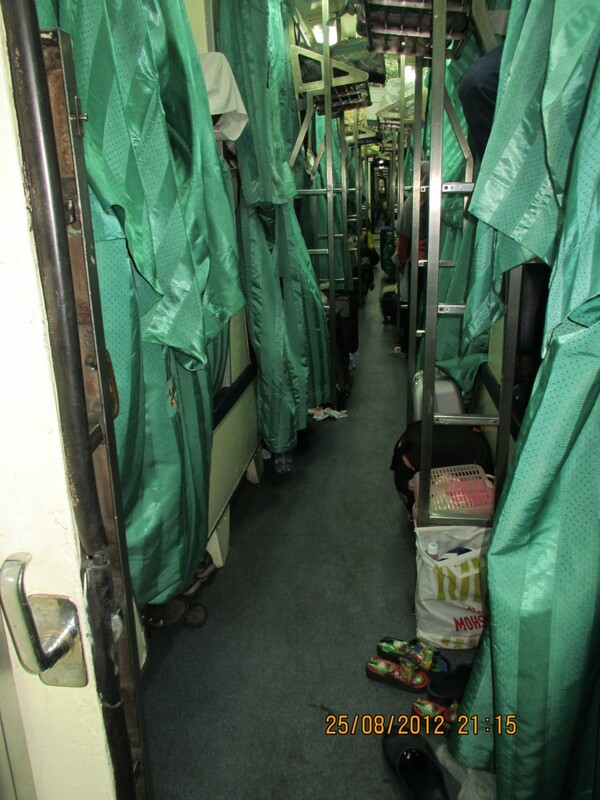 The second class air-conditioned sleeper carriage I was in was the last carriage. and then the dining car. 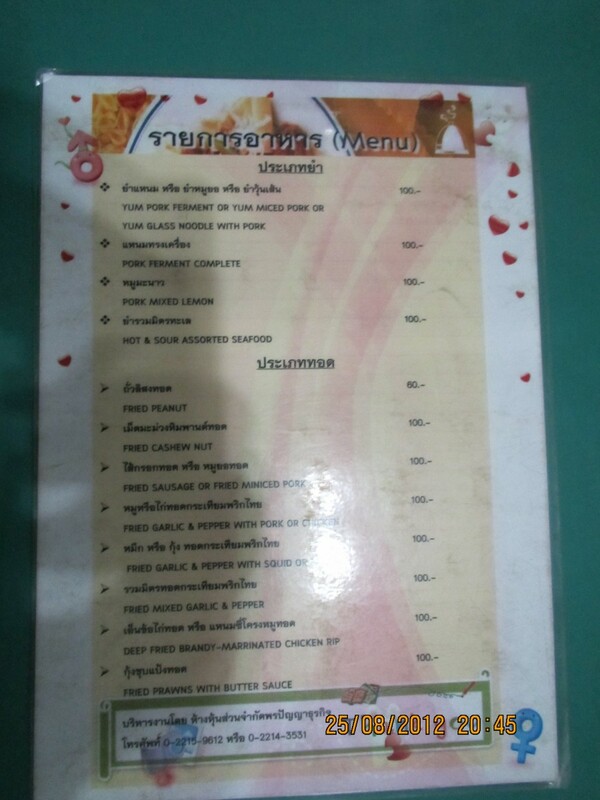 I don’t know if there were any carriages further in front, as the dining car was my destination. I thought it would be perhaps better to wait until the train stopped to move through to the dining car. 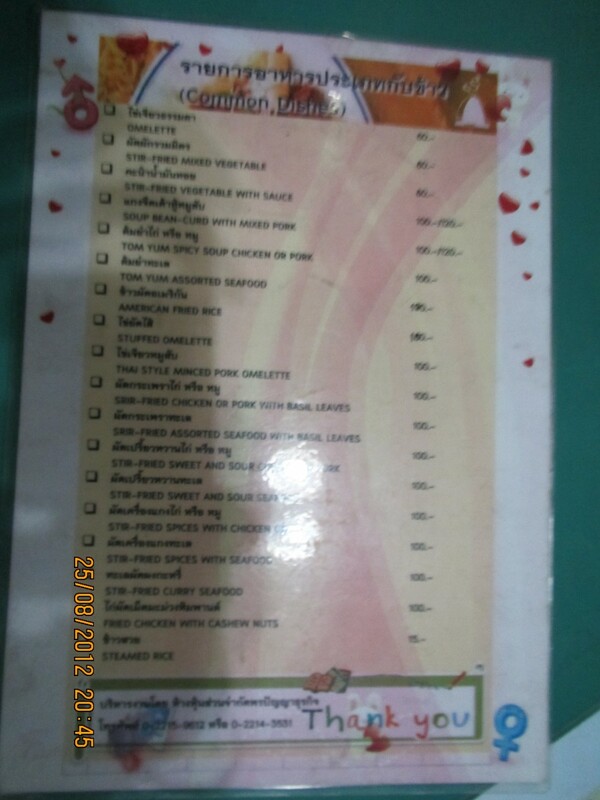 Following are some photos of the menu, but they are blurred as the train is not very stable or smooth. I ordered chicken and cashews, and it was nice. 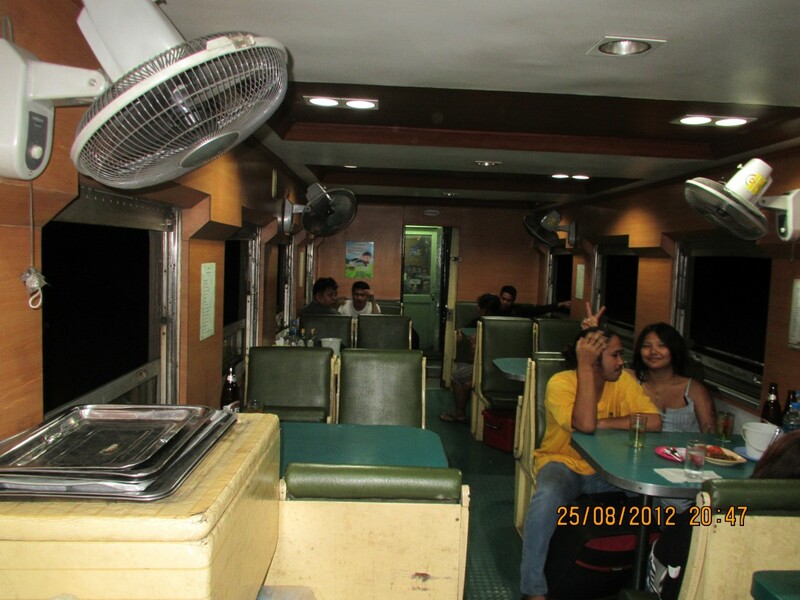 The dining car was quite a pleasant place. By Surat Thani we were running one and 1 /4 hours late. On the platform I saw many foreigners sitting and waiting, although I have no idea why. 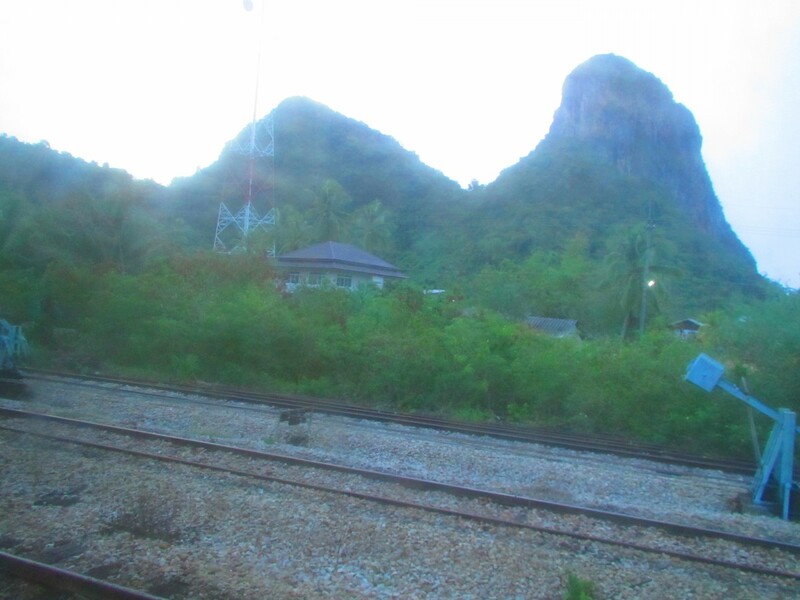 The train continued on through the night, and the attendant slept, and when it became light I was wondering how we were progressing. 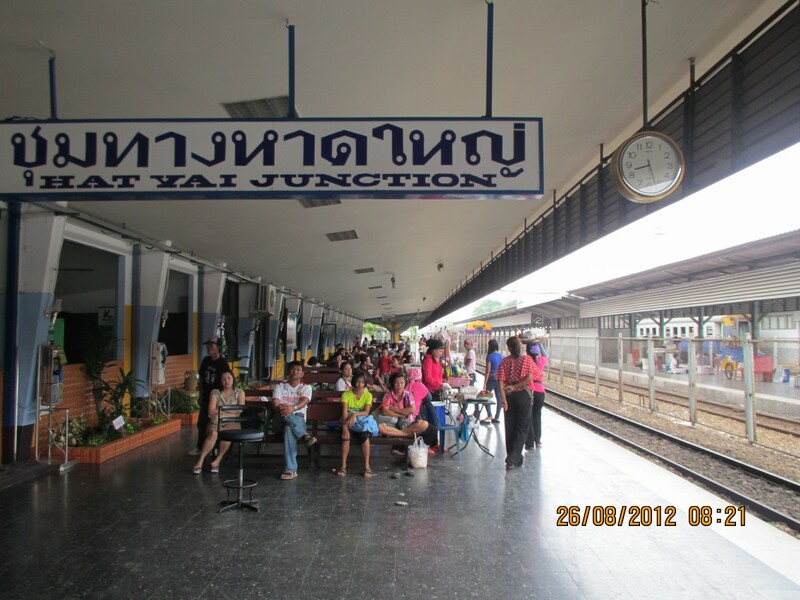 We arrived in Hat Yai around 8 am, one and 1 /4 hours late. I got off, but worked out I couldn’t continue on the Butterworth train, so decided to get a minibus. 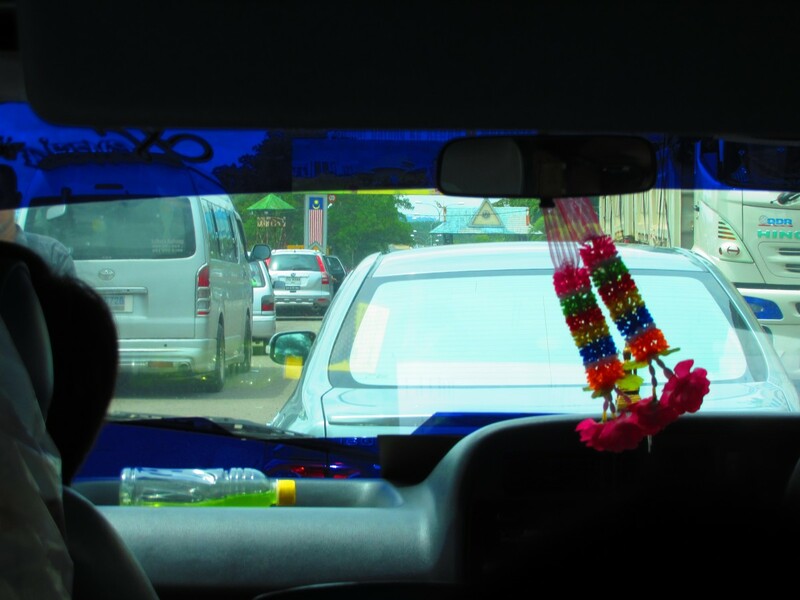 A company across the road quoted me 550 baht to Penang, so as the normal fare is 300 baht I rang up another company and asked to catch their 9am service, and said I was at the station, and asked to be picked up – which they did at 9am. We went back to the office to pay, and they wanted to see my passport. Then we drove and picked up some others, and then headed south. Only the driver and front passenger had seat belts, so it wasn’t so safe. And the driver drove very fast. 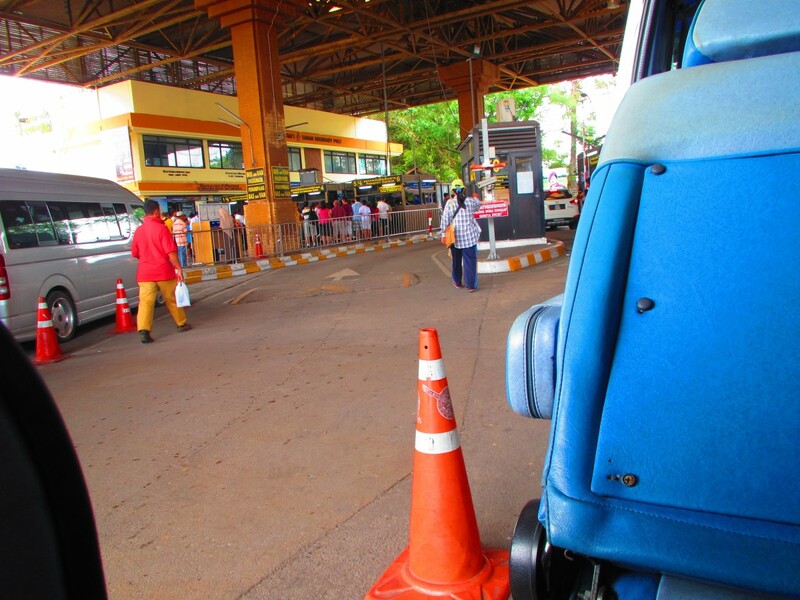 At 10:40 we were at the Thai border, which wasn’t so crowded, and so were through in 15 minutes – leaving the luggage in the minibus, and just showing our passports and departure card. At the Malaysian border a few minutes later a lot of people were waiting, but we were processed fairly quickly. We had to also take our luggage and put it though one of those airport type scanners. By 11:30 we were on our way again. 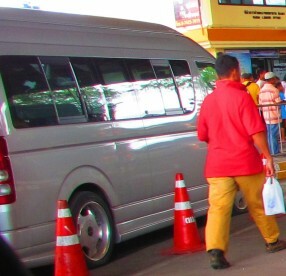 We were dropped at Komtar about 2:30 pm, for a total trip time from Hat Yai of 5 1/2 hours. 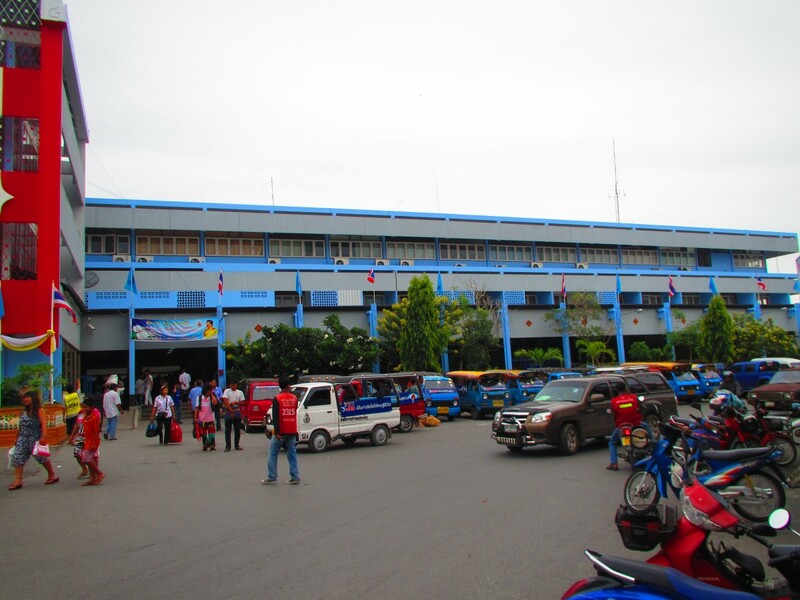 We should have also had the option of alighting at Chulia Street, but the driver didn’t want to. 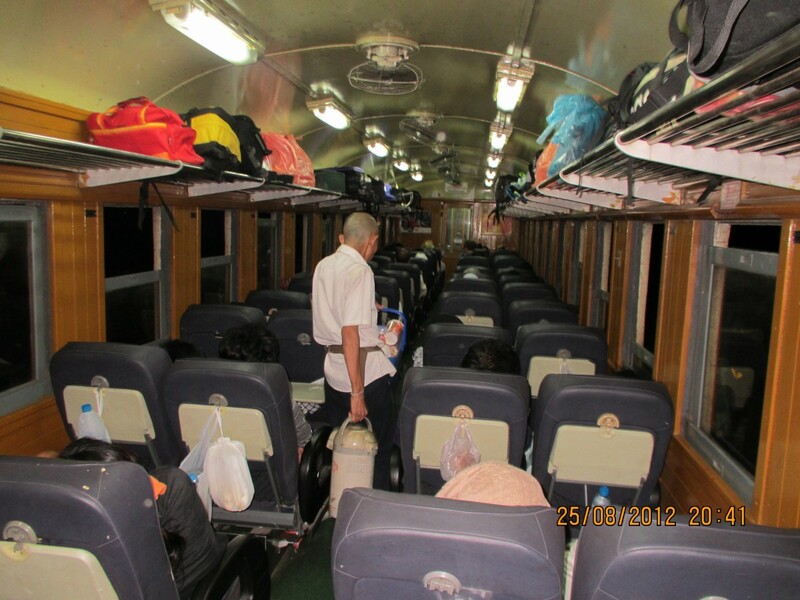 Overall, then, if I had the chance , I would book in advance for a lower berth in the train for the whole Bangkok – Butterworth trip. It is safer, more comfortable, and easier. 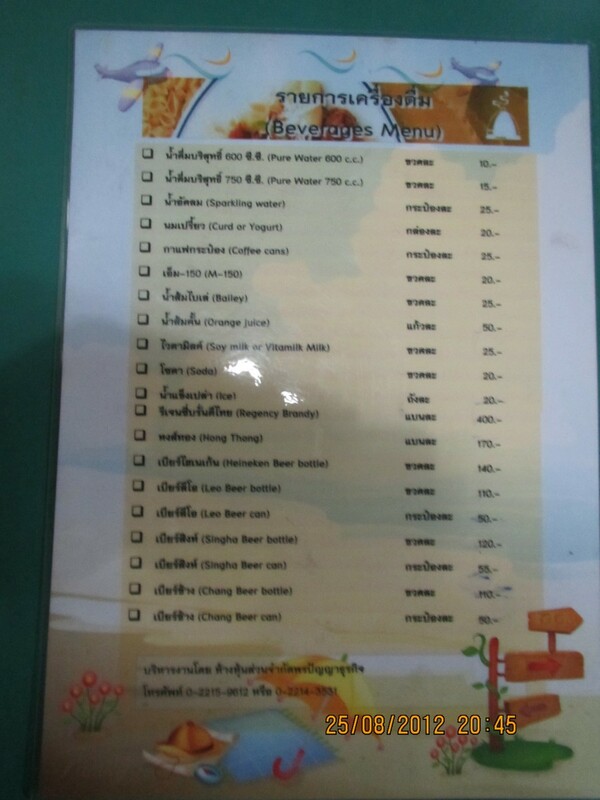 Just don’t expect any alcohol to be served on the Malaysian side of the border. Good Write up n Story!! Thanks Ian, for sharing your Time here!! Thanks Ian for your informative report. 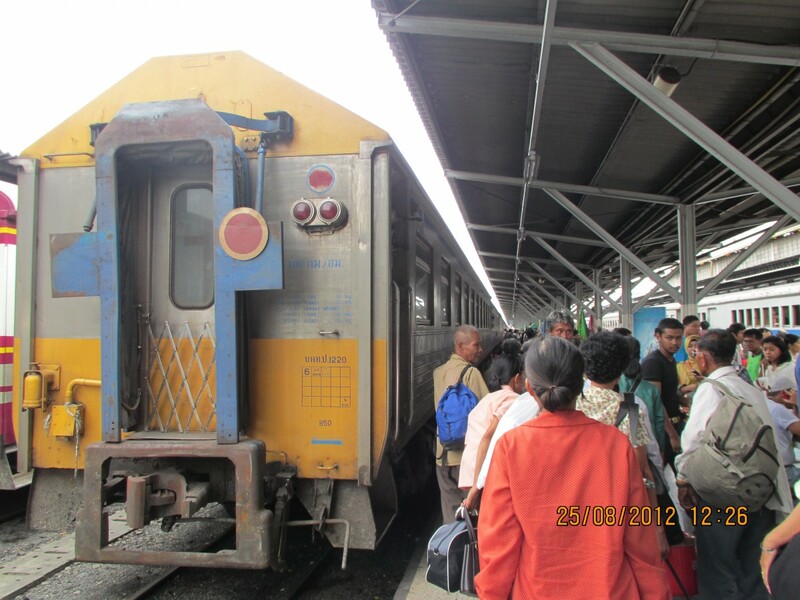 I will be taking the train from Bangkok to Butterworth in December 2012. Fortunately I book my ticket online just in case because I have a important appointment the day after I reach Butterworth. I’m from Kuala Lumpur. 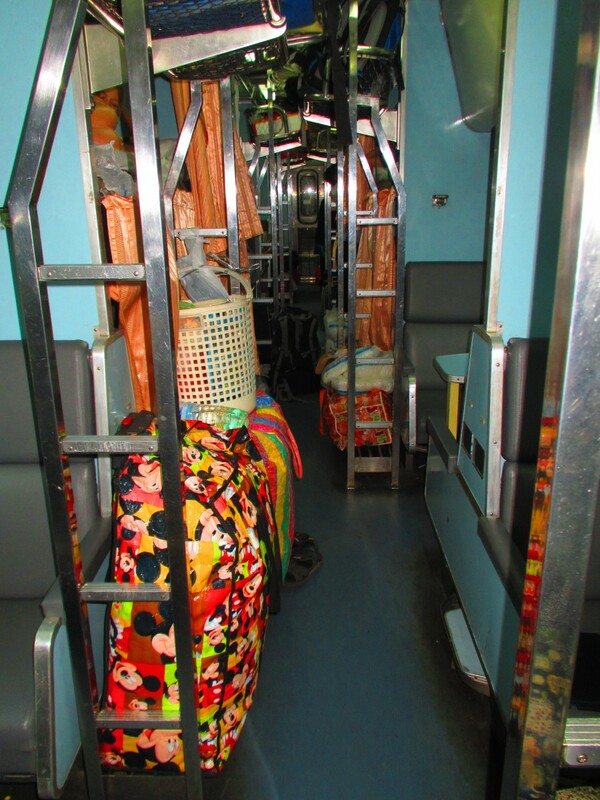 I am rather nervous about the trip because this is the first time I’m taking this train although I have tried the Kuala Lumpur – Butterworth – Hatyai route. (return trip) Takes about the same time and it was terribly boring. Hi Ian, thanks for the write-up….very useful indeed. May I ask, what were the state of the toilets like in the night trains? Are they western style? Thanks, Jess. Unfortunately the toilets were pretty disgusting. I think they were western style, but I’ve caught a few trains since then and I can’t be sure my memory is correct about them.